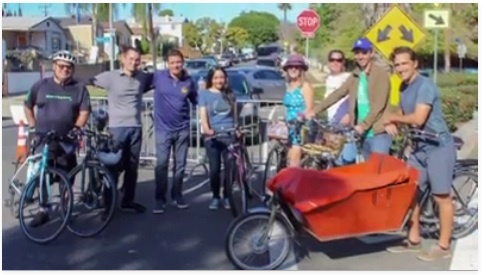 Los Angeles City Councilman Jose Huizar on Saturday took part in ground breaking ceremony for a major transportation and safety upgrade project in El Sereno along Alhambra Avenue. Huizar’s office said local residents, led by the El Sereno Arroyo Playground Vecinos and the Concerned Neighbors of El Sereno, have been requesting improvements along the street for years. The changes on Alhambra Avenue will bring safety improvements along a 1.5 mile stretch that runs from Valley Boulevard to the Alhambra city limit, which Huizar’s office said is a dangerous route that has been the scene of several traffic collisions, including a hit-and-run in 2017, which took the life of a young mother. The improvements will be near the El Sereno Arroyo Playground, which opened in 2013 on the corner of Alhambra Avenue and Lowell after Huizar reached a deal with Caltrans to lease the land to the city. The planned improvements include a new traffic signal light at Lowell Avenue, a new sidewalk adjacent to the El Sereno Arroyo Playground, a new crosswalk with flashing lights at Alhambra and Hollister avenues, bike lanes between Alhambra’s city limit and Valley Boulevard, center left-turn lanes, and a future art wall welcoming all to the El Sereno community. Construction is expected to continue through the end of May. The groundbreaking took place at El Sereno Arroyo Playground at Alhambra and Lowell avenues. January 18, 2018 Copyright © 2012 Eastern Group Publications, Inc.